Rhododendron rex H.Lév. ssp. fictolacteum (Balf.f.) D.F.Chamb. Garden collector: Cubey, H. Suzanne & Corrie, J.
isotype of Rhododendron lacteum Franch. var. macrophyllum Franch. 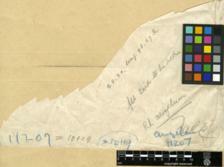 holotype of Rhododendron rex H.Lév.